"The Core i7's general purpose performance is solid, you're looking at a 5 - 10% increase in general application performance at the same clock speeds as Penryn"
and now look at the graph below. Intel has apparantely allowed HP and Fujitsu-Siemens to break the NDA on the Xeon 5570 processor for PR reasons as both companies have published SAP numbers on a Dual Xeon 5570. The Xeon 5570 is based on the same architecture as the Core i7. It is a 2.93 GHz quadcore CPU with 4 times a 256 KB L2-cache and one huge shared 8 MB L3. 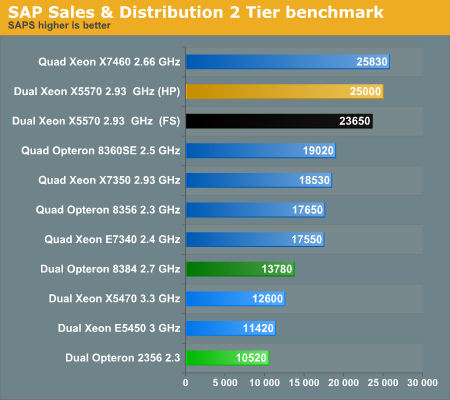 The SAP numbers are absolutely astonishing, as Intel's dual socket is able to outperform quad socket opteron machines. Based on the scaling of Barcelona, we speculate that a quad Shanghai at 2.7 GHz would obtain the performance of the Dual Xeon 5570 w/o HT.The new Xeon 5570 outperforms the "old" 5450 by 119%!!! These numbers are so high, that we checked and checked again. The database used is the same (SQL Server 2005), so unless there is some incredible tuning parameter that HP and FS have discovered and that we have yet to hear about, that is not it. One of the biggest bottlenecks for Intel has been the sync latency. It is possible that once the "sync" bottleneck was removed, the intel architecture is able to show it's real integer crunching power thanks to the out of order loads (memory disambiguation) and better branch prediction.Those are two areas where the opteron architecture is still weak. The slightly lower latency of the L3-cache of Nehalem helps too. This kind of software also makes the buffers fill up due to the long dependency chains. Those OOO buffers have been increased and the depencency chains have been shortened by a very low latency L2 cache and relatively fast L3. Still we are absolutely amazed that the difference is this large. We would have expected Nehalem to outperform Shanghai by lower margins. Although we still are a bit skeptical that the difference is this large ("too good to be true" syndrome), we do not see how you could artificially inflate a SAP benchmark. It sure is not as easy as SPECJBB or SPECfp/int. I think that the Core architechture stars to shine with the add of the Memory controller on die. Having memory controller outside gives you flexibility in the mainboard/chipset selection, but you pay this with latency. Now the improvements in the Nehalem (wider execution units, HT, blah blah blah) plus the Ondie memory controller gives the CPU all the bandwidth neccesary to has the CPU very busy crunching integers. Yes, indeed, "Head's off those Intel Engineers!" both systems have HT on, check the detailed scores. Good point, I updated the blog post. Well, when I see a +100% boost over the previous generation we have to be prudent.